The Stunning Decor At This Reception Will Make You Go WOW! 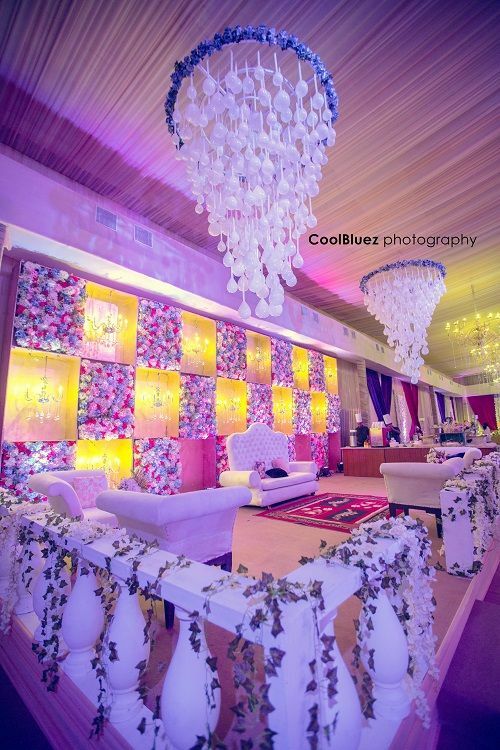 When CoolBluez Photography sent us these stunning decor images, we couldn’t help but marvel at all the gorgeousness. 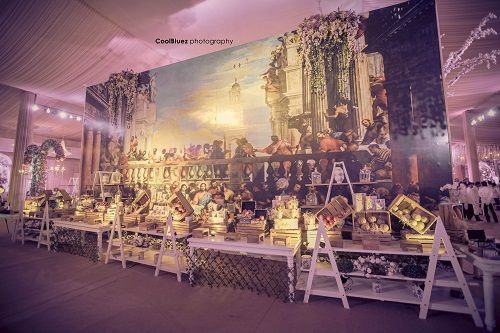 A wedding reception in Agra, this one was inspired by the Buckingham Palace in London, and one look at the pictures is sure to blow your mind away. 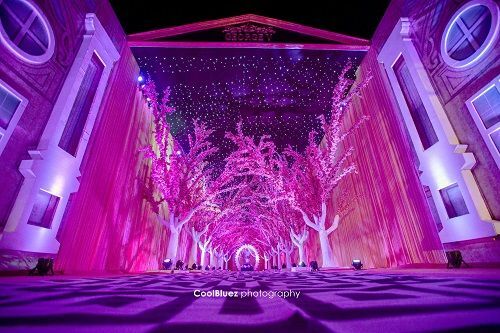 The theme of the evening was Magnificent London and the artists recreated the magical gardens of the palace complete with pretty cherry blossom trees and giant palatial gates. Like, really, it looks straight out of a movie set! 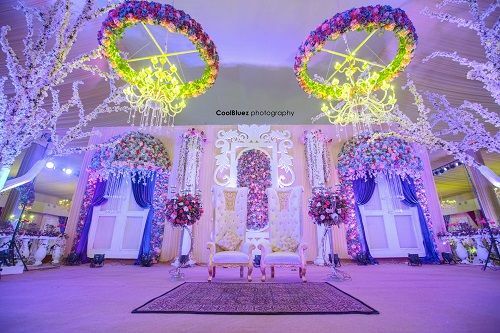 The decor took around 20 days to be completed (with months of planning) and was done by Ferns and Petals. Here, take a look! 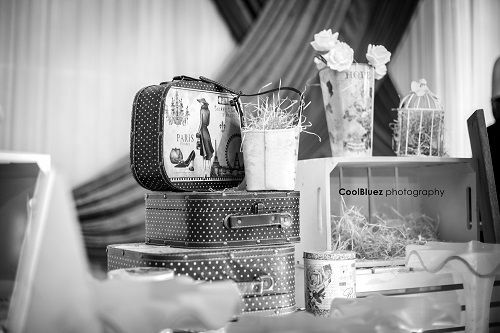 A star lit sky and trees blooming with pink flowers… The venue was dominated by elements like little vintage suitcases and flower vases to give the guests a true feel of London. 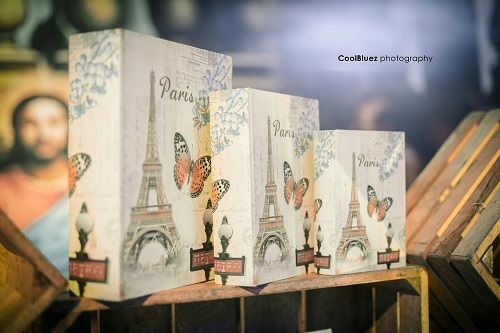 Dreamy birdcages and travel books added charm to the evening. 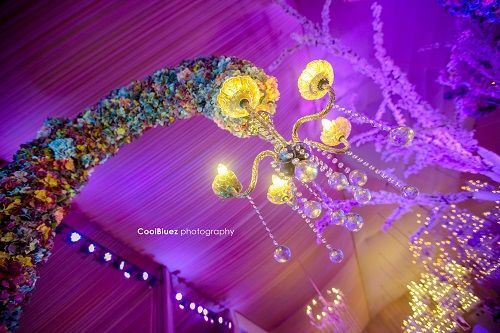 The artists created a beautiful wreath of exotic flowers suspended mid-air with a dangling chandelier in gold. 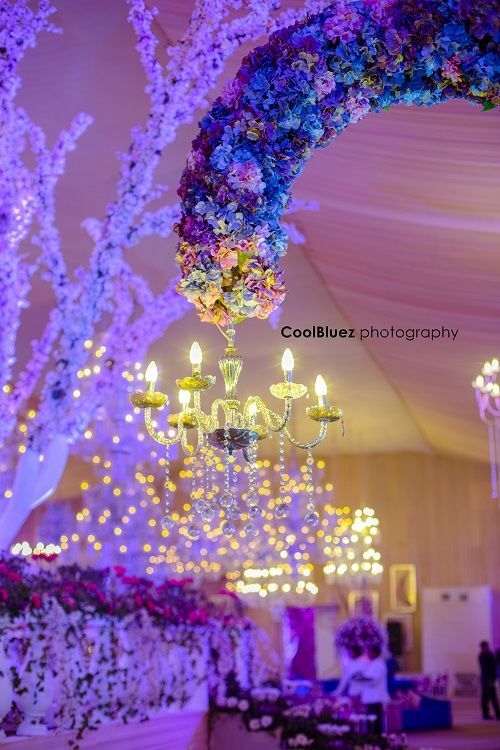 We love the mix of flowers, the crystals, the colours and the dramatic lighting. So magical! Also read: Wedding Decor Ideas That Look Way More Expensive Than They Are! How pretty is this seating area! 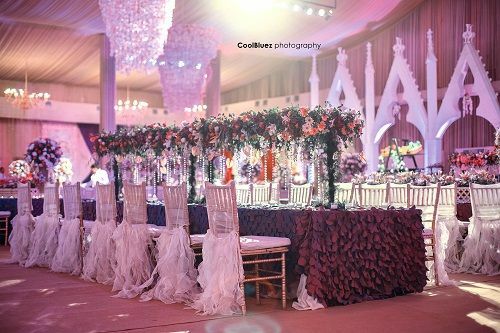 The backdrop of pastel flowers and mini chandeliers is absolutely enchanting and elegant. 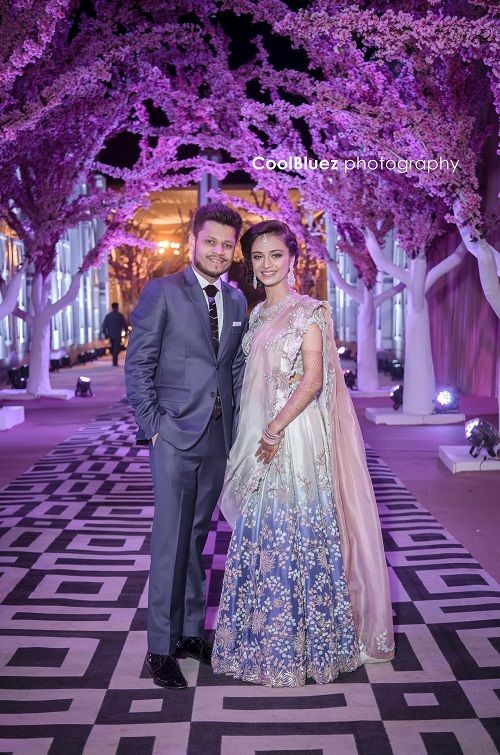 The newlyweds Akanksha and Nikunj pose at the entryway for their dream wedding reception. 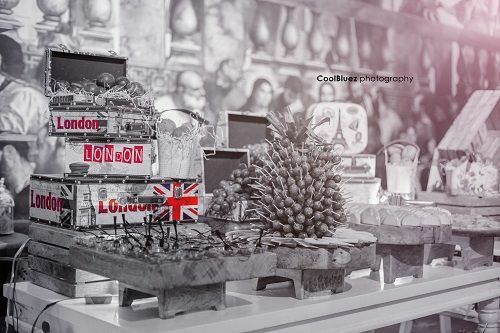 The food counters too had a true vintage feel with lots of wooden crates and fruits stacked in each one of them. A giant painting of the palace formed the backdrop here. An English sit-down dinner that took you right back to the Victorian era! Delicate white net for the chair drapes and a wine table cover with lots of frills. Don’t miss the elaborate table runner of leaves, twigs and flowers. So unique! 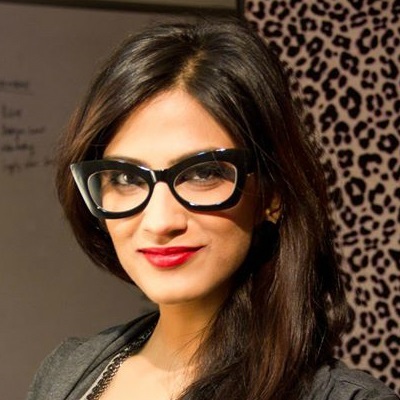 Also read: Are You A KJo Bride?! 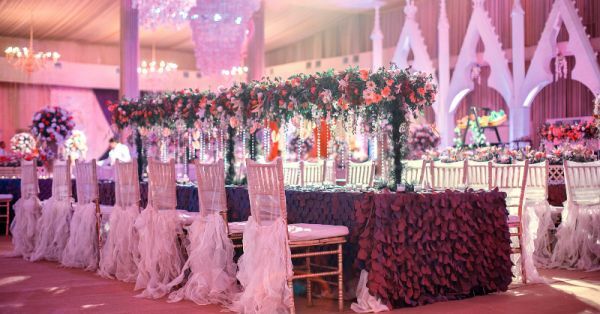 11 Ways To Add “Bollywood” To Your Shaadi Yet another enchanting seating area complete with high back chairs, pretty florals, crystal strings and soft yellow lights. Beautiful, isn’t it?! A place where girls can talk about ANYTHING. (No guys allowed!) ? ? Get the POPxo app NOW on Play Store and iOS App Store.